The US Census Bureau released a report in March of 2011 revealing that between 2000 and 2010 the US Hispanic population grew 43 percent from 35.3 million to 50.5 million. Its share of the total population rose from 13 to 16 percent. That accounts for more than half the total US population growth since 2000. Given this growth in the Hispanic population, it may not be uncommon to encounter patients who either speak limited English or no English at all in the physical therapy setting. Me llamo (your name here). – My name is (your name here). ¿En que trabaja? - What do you do for a living? ¿Qué occurió? - What happened? Le practicaron una cirugía. – You had surgery. ¿Te caíste? - Did you fall? ¿Tuviste un accidente? - Were you in an accident? ¿Cuándo occurió? - When did it happen? ¿Por cuánto tiempo ha tenido el problema? - How long have you had the problem? ¿Ha ocurrido antes en el pasado? – Has it happened before in the past? ¿En dónde se lastimó? - Where did you get hurt? ¿Tiene dolor? – Do you have pain? Describa su dolor. – Describe your pain. ¿Es agudo (sharp), sordo (dull), adolorido (achy), punzante (throbbing), quemante (burning), súbito (shooting), punzante (stabbing)? – Is the pain sharp, dull, achy, throbbing, burning, shooting, stabbing? ¿Cuánto dolor tiene usted en una escala de cero a diez donde cero es la ausencia de dolor y diez es el dolor más fuerte? - How much pain do you have on a scale of 0-10 with 0 being no pain and 10 being the worst pain? ¿Tiene algún entumecimiento u hormigueo? - Do you have any numbness or tingling? ¿Le duele al sentarse (sit), pararse (stand), caminar (walk), agacharse (bend), levantar (lift), se agacha (squat), transportar (carry), subir escaleras (climb stairs)? - Does it hurt to sit, stand, walk, bend, lift, squat, carry, climb stairs? ¿Qué alivia su dolor?? - What gives you relief? ¿Es su (body part ie. espalda) rígida? 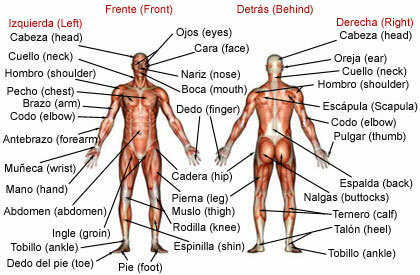 Is your (body part – see Figure 1 ie. back) stiff? ¿Qué son sus objetivos con la terapia? - What are your goals for therapy. Parese por favor. - Please sit up. Siéntese por favor. – Please sit down. Acuéstese sobre su espalda. – Lie down on you back. Acuéstese de frente. – Lie on your front. Voltee – Turn over to your other side. ¿Le duele cuando hago esto? – Does it hurt when I do this? Dime cuándo duele. – Tell me when it hurts. Me gustaría examinar su fuerza. – I would like to test your strength. Me gustaría poner a prueba su rango de movimiento. – I would like to test your range of motion. Mantenga esta posición. – Hold this position. No me deje moverlo. – Don’t let me move you. Manténgalo derecho. – Keep it straight. Doble a la izquierda – Bend to the left. Haga este ejercicio. – Do this exercise. Camine para mí. – Walk for me. Sigue lo que hago. – Follow what I do. Tome un descanso. - Take a break. Usted tiene debilidad. – You have weakness. Usted tiene la rigidez. – You have stiffness. Usted tiene los músculos tensos. – You have tight muscles. Usted se esguinzo en un ligamento. – You sprained a ligament. Usted se desgarró un ligamento. You tore a ligament. Usted se desgarró un músculo. – You pulled a muscle. Usted tiene problemas de equilibrio. – You have balance problems. Usted tiene tendinitis. – You have tendonitis. Usted tiene una hernia discal. – You have a slipped disc. Usted tiene problemas con su mecánica. - You have problems with your mechanics. Usted tiene problemas con su postura. – You have problems with your posture. Usted tiene artritis. – You have arthritis. Usted tuvo un derrame cerebral. – You had a stroke. El nervio se irrita. – The nerve is irritated. Me gustaría que vinieras a la terapia dos veces por semana durante cuatro semanas. – I would like you to come to therapy 2 x a week for 4 weeks.